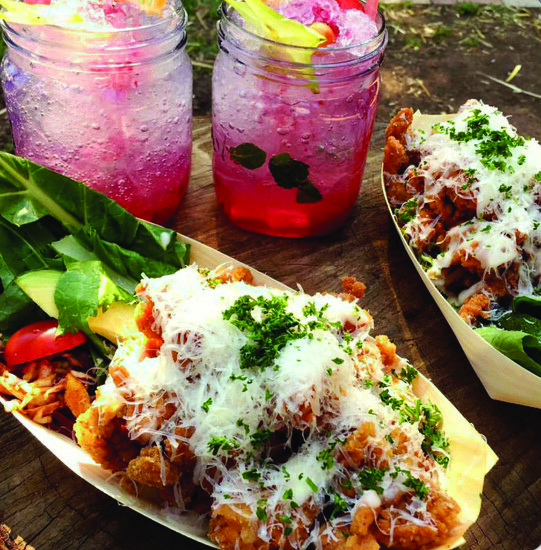 Always on trend Joburgers have embraced the idea of street food, giving it a local twist by not serving it in the street. From dim sum to tacos, bunny chows to souvlaki, these casual and fast food favourites are on the city’s menus. This colourful casual taqueria operated by Dave and Katrin Smale started out as a market stall. Specialising in Mexican street food this is a cutlery-free zone, where you’ll find a menu of freshly-pressed tortillas filled with delicious bites of medium rare skirt steak, prawn, haloumi and vegetables, or pulled pork. Everything here is freshly prepared, full of spicy goodness. Finish the meal with churros accompanied by velvety dark chocolate sauce. Opposite the historic Rand Club in downtown Joburg and just a few doors down from the heritage landmark Cornerhouse, City Central was formerly the location of Barclays Bank’s South African headquarters. Built in the early 1940s by leading architect Gordon Leith in the early-modernist style the building mixes an understated neoclassical facade with a towering triple-volume marble banking hall, above which hangs a giant brass chandelier. Find Bridge Books and the Brass Bar upstairs while the original banking hall is occupied by the food hall with a good selection of weekday stalls serving up freshly baked croissants, doughnuts and cupcakes, gourmet burgers, Indian curries, dim sum and other tasty lunch fare to enjoy on the go or at one of the long tables. 85 Commissioner St, City Centre. Expect to be touching elbows and ears with neighbouring diners at this tiny pizza bar. The dining room only seats about 25 people, who usually crowd around tables or at the counter overlooking the street. Coalition’s accomplished wood-fired pizzas, topped with fresh buffalo mozzarella, are made according to authentic Neapolitan methods and there are nine variations on the menu. In the back of the restaurant is a ‘secret’ cocktail bar Sin & Taxes. 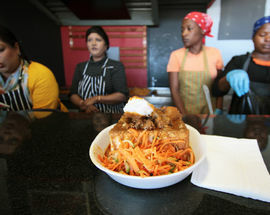 Known far and wide for its bunny chow (a hollowed-out bread loaf portion filled with curry, that is said to have originated among the Indian community in Durban in the 1940s) this takeaway spot specialises in traditional Durban Indian curries sold in traditional roti rolls, bunny chows and biryanis. The food is flavoursome, prices are low and portions are huge. Limited seating is available on makeshift benches and tables outside or inside in the café area. Food is freshly prepared once daily and the queue tends to build up so make sure to arrive before midday. Behind Shell Garage, cnr Rivonia and South Rds, Sandton, tel. +27 84 603 2466. This energetic Maboneng eatery with its sombreros and happening cocktail bar is a bright spot on the city map. The dedicated mixologist serves tasty mixes that include a basil and fennel infused gin. Cheerful and quirky with photocopied menus and plenty of Day of the Dead references The Gringo Café is the love child restaurant of a South African couple who decided to take their home chef skills public. The menu is a tasty fusion of Mexican and African flavours. Try the Carne Asada fries, cheesy fries loaded with pulled beef, guacamole and salsa and the pulled beef or chicken tacos. The El boerie roll, is a local classic of minced sausage topped with a taste of Mexico. 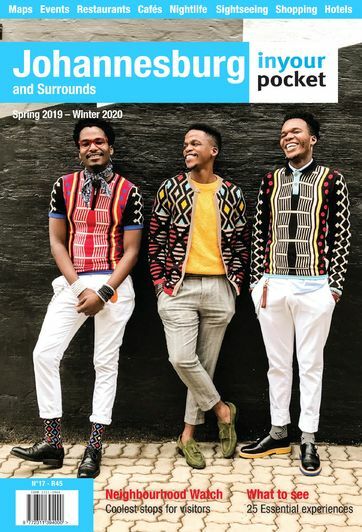 262 Main St, Maboneng, tel. +27 79 713 9214. 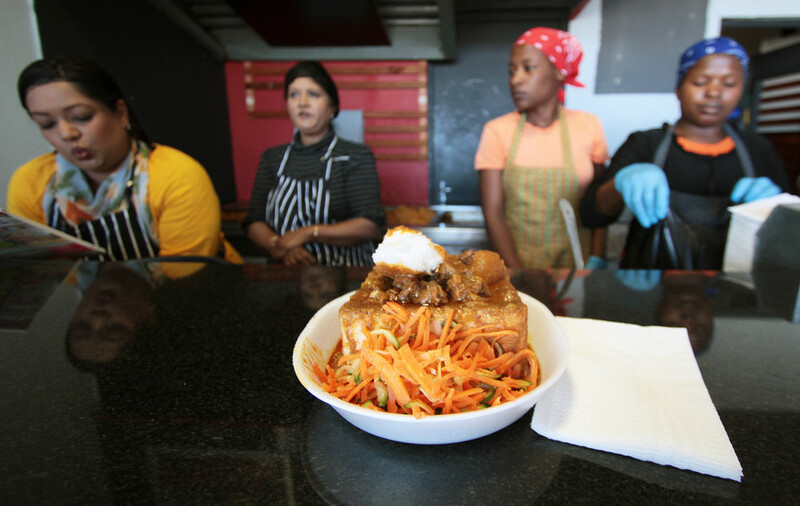 A tiny no-frills Ethiopian café in fashionable Maboneng serving traditional platters of stews atop spongy injeera. The menu is brief and the owner is always on hand to guide you through the day’s specials. Maverick Corner, cnr Commissioner and Maritzburg Sts, Maboneng, City Centre, tel. +27 72 340 2020. 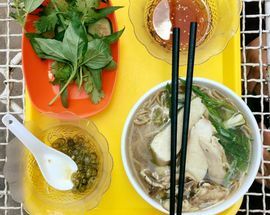 Specialising in Taiwanese street food with a twist this Greenside restaurant has a wide-ranging menu with plenty of small dishes to be shared. Start with traditional potstickers, Norwegian salmon tacos, and crispy Korean fried chicken wings; the twice-cooked beef ribs are excellent while the bao (steamed buns) are worthy of applause. There’s also a good sushi menu. The dessert offer is slim and odd, but post-feast you won’t mind. 139 Greenway Rd, Greenside, tel. +27 10 900 4889. Paul Ballen began his ice cream chain by hosting Sunday tastings at his parents’ home in 2014 after receiving an ice cream machine for his 21st birthday. Paul’s Homemade Ice Cream is made with integrity, (no chemicals or synthetic additives) in an enticing range of flavours. New flavours are constantly added. Taste the roasted pistachio and honey ice cream with gold edible glitter or order the store speciality, a filled handmade sugar cone, coated with chocolate and piled with ice cream topped with caramel or chocolate fudge sauce. Cnr Jan Smuts Ave and 6th Rd, Hyde Park, tel. +27 79 581 0602, paulshomemade.com. 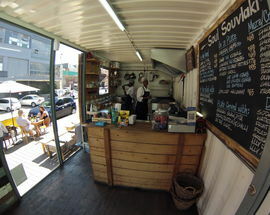 This double-story souvlaki shop is cleverly built out of a reconstructed shipping container. 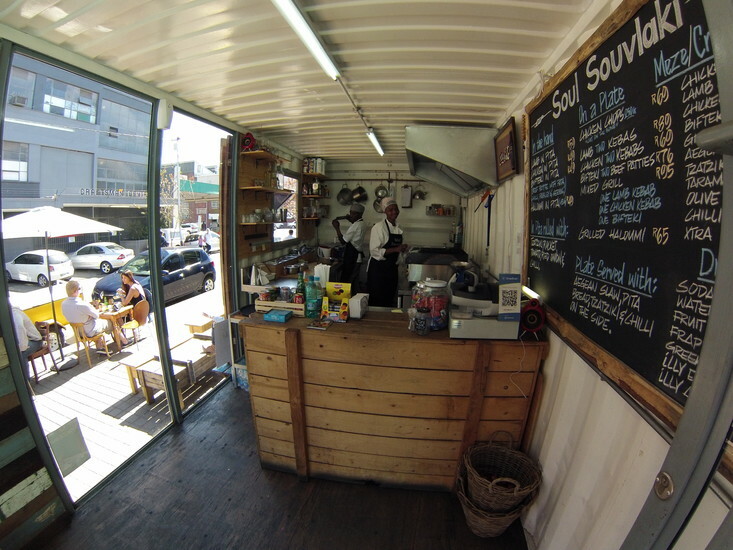 Soul Souvlaki has come a long way since owner Dino Vlachos started out with a market stall at Maboneng’s Sunday Market on Main in 2012, drawing the crowds with his freshly made Greek street food. It’s hard to choose between the lamb, chicken or haloumi souvlaki, each prepared with tsatsiki and salad in a freshly baked pita so make sure to arrive hungry. The deck with its excellent playlist and bar is a great place to wind down a day. 8 Albrecht St (cnr Fox St), Maboneng, City Centre, tel. +27 72 300 0896. 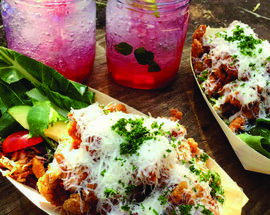 Crispy chicken strips are the main ingredient at this minimalist gourmet street food joint and the place is fuelled by the same energy you’ll find at the weekend market stalls where Sumting Fresh first opened and still operates. With their own lingo and a range of signature chants, a love of fried chicken plus innovative dishes such as ‘Gujon’ Chicken (strips served with Asian slaw, skinny fries, aioli, sweet chilli sauce and a watermelon slice), and the unforgettable Gua Bao (a Taiwanese steamed bun filled with chicken and sriracha mayo), this place provides maximum satisfaction for fans of the chicken. 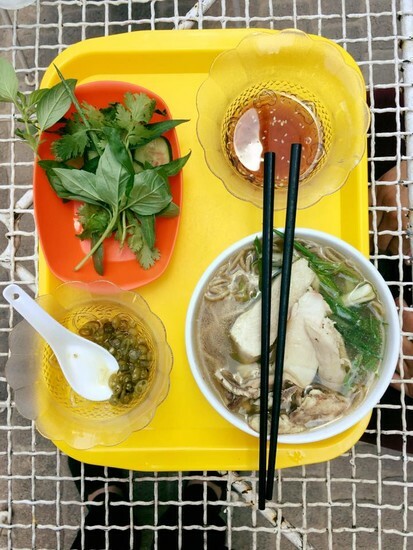 It's no surprise it landed on the The Guardian’s list of ‘Ten amazing street food market stalls across the world’ (2015). 79 Grant Ave, Norwood, tel. +27 11 483 2331, sumtingfresh.co.za. 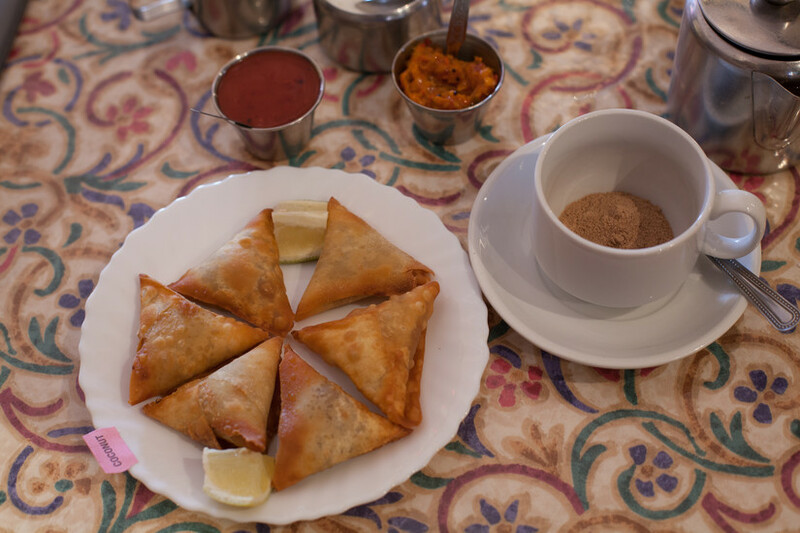 Tucked in to the shopping mecca Oriental Plaza this busy restaurant with a fast food counter is famous for its wide variety of samoosas. 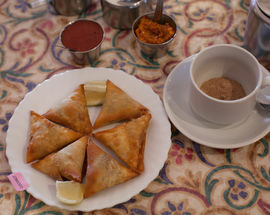 Try the coconut samoosas with some masala tea. Oriental Plaza (Upper Mall), cnr Albertina Sisulu Rd and Lover’s Walk, Fordsburg, tel. +27 11 833 1139, worldofsamoosas.co.za.